A fan-front dress wouldn’t be called such without copious amounts of hand-gathering in the bodice. With that in mind, I thought I would show how I did the fan on the fan-front (LM #114) that I’m working on right now. First, I marked the gathering lines (the pattern comes with a handy template for this!) on the wrong side of my bodice, transfering the marks using tracing paper and a tracing wheel. 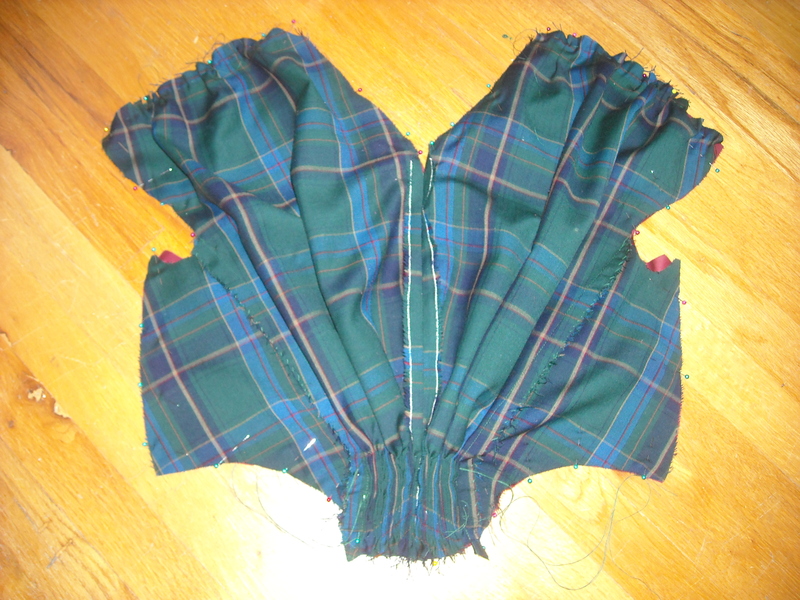 Then I gathered the bodice (7 rows on the bottom to make the fan, and 1 row on each of the shoulder seams). Right-side view of the fan after being gathered. Click to enlarge. Next, I pinned the bodice right-sides together to the lining, pinning around the sides and middle. 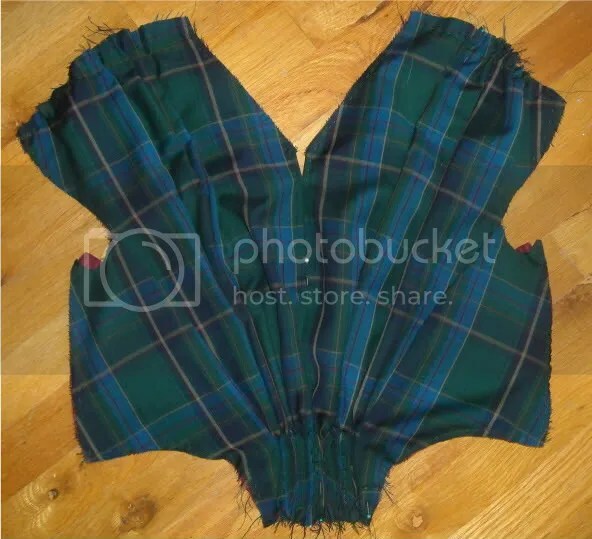 The pattern recommends to do this, and the purpose is to gather the fan and secure the threads to the inside of the bodice, so you don’t have huge knots on the outside of your bodice. I then pulled the threads up to make a fan, stopping when the outline of the fan matched the outline of the lining. When that happened, I tied the threads together (2 strands at a time) and then clipped the excess. I didn’t bother to do this with the top shoulder seams, since I belatedly decided to pleat them instead of gather. After I had the fan all tied together, I then un-pinned it from the lining. 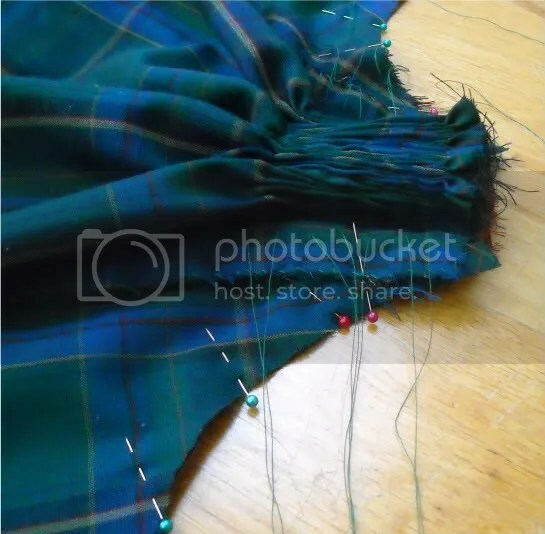 Then, I re-pinned it, wrong sides together to the lining, this time matching the newly-created fan to the lining, and drawing and pleating the shoulder seam to match the lining. The fan inside-out and pinned to the lining. The lining sticking out of the armscyes was a mis-cut on my part and will be trimmed to match the outline of the green wool fan. Click to enlarge. 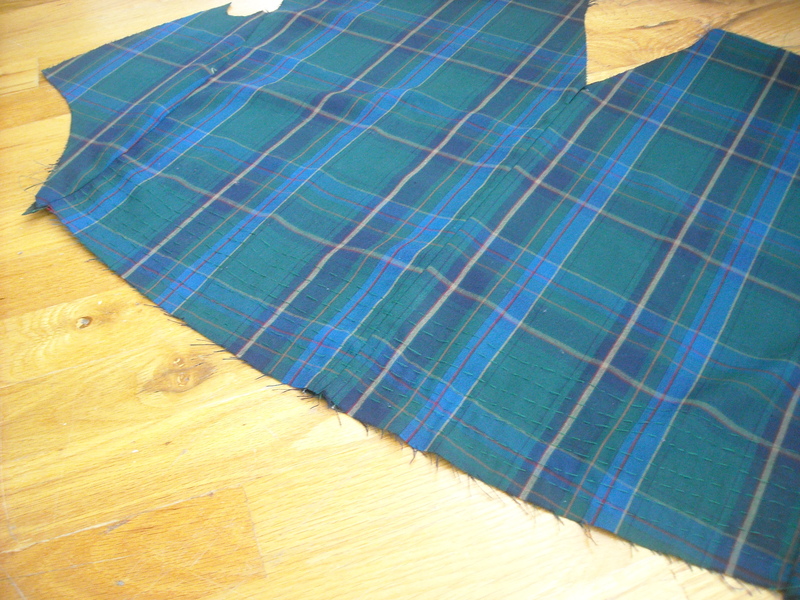 Then I basted the lining and fan together with a running stitch. These two pieces will now be treated as one (which is called flat-lining) and sewn to the two back bodice pieces. 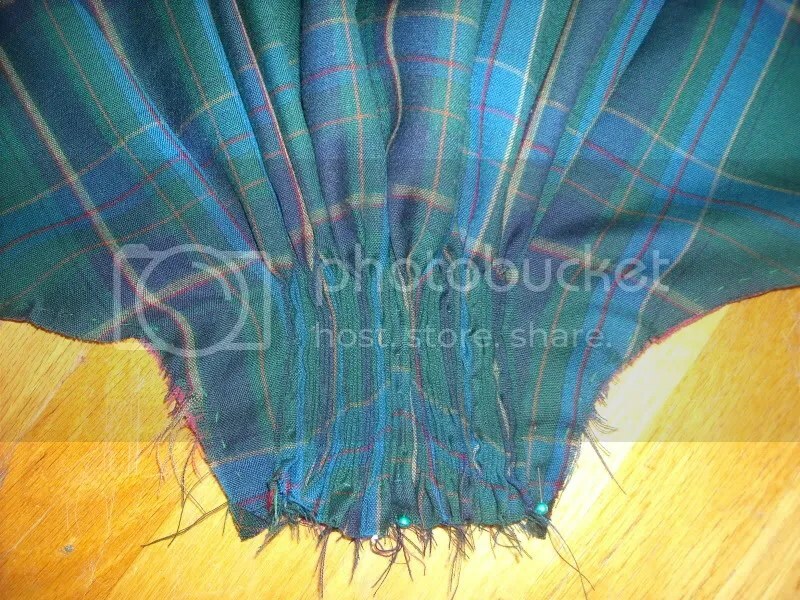 Next Post Green-Plaid fan-front done! Oh, what a wonderful plaid! Is it wool or cotton? It’s hard to tell from the pictures. Thank you for this tutorial. I have not made a fanfront yet. I’ve got some lawn with which I need to make something, maybe now is the time? You’re so welcome! And I think a lawn fan-front would be absolutely stunning, especially for the warmer weather reenactments we have coming up just around the corner. I am about to try the 114 round dress, any suggestions? I bought a cotton with a double diagonal diamond print on it, with the squares about an inch, it seems pretty appropriate, what do you think? My daughter is doing a reenactment of the pioneer hand cart trek of the 1850s during spring break when it will potentially be hot. Plaids are always a great option for 40s/50s dresses (some colorways are more accurate than others, so that’s something to watch out for!). Since you mentioned your daughter will be doing this reenactment where it may potentially be hot, a printed cotton lawn or voile is a great option, as the fabric is lighter and will “breathe” easier, thus keeping her cooler. Good luck with your dress and hope your daughter as fun at her reenactment!